Surprise, surprise - WorldVegan Saturday yielded another Asian dish. I'm not complaining. Asian cuisine is my jam. This weekend there was a lot of events that took place and in order to be a part of all them, WorldVegan Saturday went for a quick and light feeding opportunity. I had never tried quinoa instead of rice in my sushi before, and I must admit it was a nice change of scenery. I'm no sushi artist, so don't let the rough exterior fool you; she's delish! Cook the quinoa as instructed. Meanwhile, while the quinoa is doing it's thing, mix the balsamic vinegar, thyme, salt, and pepper in a container with a lid. Cut your tofu into small strips and toss in the marinade (don't forget to put the lid on the container first!). 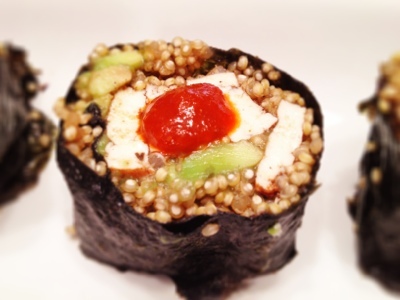 Flip the tofu when quinoa is half-finished and then cut your avocado into small slices. When your quinoa is done, take 1/2 tablespoon of the marinade and stir it into the quinoa. Spread quinoa over Nori. Lay tofu and avocado into rows, and roll. Seal by dipping fingers in water and pressing closed; dampen entire roll for easier cutting.